When I was thirteen, I owned my first rock album, Infest, by Papa Roach. And when I say owned, it was actually borrowed from the girl who sat next to me in class. My mother would have never permitted purchase of an album with that well-placed black and white sticker that advises parents of explicit lyrics inside. Needless to say, the explicit lyric label was down to one delightfully placed F word in the second line of the first song on that album. If you are or ever were a Papa Roach fan, you know the song I mean. I snuck it home and enjoyed it for a full two hours before my mother overheard said lyric and the CD was confiscated. I was grounded, and spent a further two months searching my mother’s bedroom when she wasn’t around to find out where she’d hid it. Note to all the teenagers out there who have felt my pain — the knickers draw is a good place to start! Fifteen years or so on, and it truly did Cut My Life Into Pieces when I got to Wembley SSE Arena on Saturday night and discovered that Papa Roach had pulled out of the opening line up for Five Finger Death Punch. I was not one of the privileged few who had heard the news the day before. In fact, I completely missed the updates that their shows in France, Belgium and Milan had all been cancelled in the aftermath of the horrific Paris attacks on the 13th of November, which poignantly counted the loss of 89 beautiful lives at the Bataclan theatre during an Eagles of Death Metal gig. Their words are true. I may have grown up a Papa Roach fan, but FFDP won my heart when I saw them at Download Festival earlier this year — few bands show their fans respect on the scale that they do, and on Saturday night they did not disappoint. 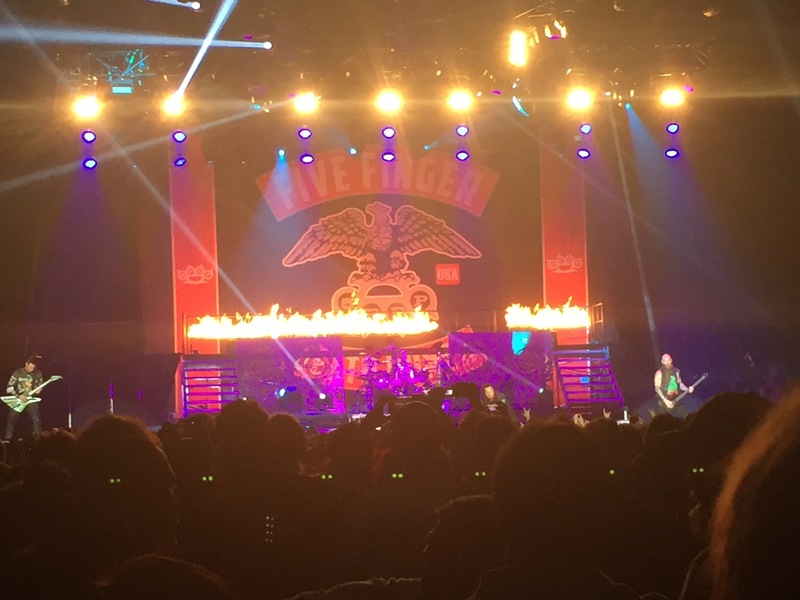 Frontman Ivan Moody told the jubilant crowd that in an interview earlier this week the reporter commented that they have the most loyal and crazy fans, and I can testify with fairly accurate conviction that the only band who supersedes FFDP with the band t-shirt uniform attitude at a gig is Iron Maiden. Ivan also crowned their fan army with a name, Bad Company. And we owned it. It was Skindred with their unique injection of reggae heavy rock, As Lions, and The One Hundred who opened the show, and we have to salute Skindred for addressing the issue of the attacks, and throwing down the gauntlet — There’s good and bad music in the world, and good and bad people, and we can’t let the bad destroy good music. Showing up for a show like this sends a message. You can’t stop rock and roll. Extra kudos to them also for inciting 50% of the male audience to take off their shirts and hoodies for the “helicopter”. Think on that. It was impressive, even if we feared losing an eye to a rouge zipper. When FFDP came to the stage, there was no messing around. They drove home a solid head-banging, mosh pit of a show. Songs like Bad Company, Far from Home and Wrong Side of Heaven were sung home, fist over heart, and Burn MF sent the pit into a frenzied blur of fists and hair as only a song with that much repetition of the F word possibly can. Loyalty in the punters and a seamless performance meant that to a relative newcomer like myself, there was no difference in the quality and crowd response between old favourites and the speaker-splitting crescendo of songs from their new album, Got Your Six. The depth in Ivan’s voice commands your soul to pay attention, and the band are all born to their instruments. A personal highlight was Jeremy Spencer’s drum solo, if anyone can slay a drum solo wearing a slinky, black, skeleton-print unitard, he wins, hands down. In the end the crowd sung them out to their heroic cover of House of the Rising Sun. It seemed to all be over far too soon, and there is hope that I do not only speak for myself when I say that although I came with another band in the forefront of my mind, I walked away with Five Finger Death Punch shuffled to the top of my playlist. For those about to rock, in such a troubled times as these, we salute you.